People around me, busy talking about their wedding plans. Most of my friends and cousin are getting married soon. Some of them are very happy, and some of the are not. Marriage in islam is has a wide concept. Is not only about male-female, but its more than that. In glorious Qur’an, Allah told us many thing about marriage. Morever, the best example ever, our beloved Prophet Muhammad salallah ‘alaih wassalam remind us about baitul-islam (marriage). How important it is. I would like to recall some prophet’s (pbuh) saying about marriage. Sadly, there are lots our muslimah sister who dont wanna get married just because they are afraid to lose their freedom. Marriage is not a prison. And it doesnt mean, but marrying someone u gonna be a prisoner. This is a very beautiful hadees from our beloved Prophet PBUH. 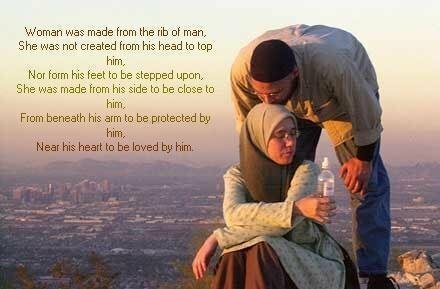 Pious muslimah inshaAllah can fulfill half deen of her husband. What can I say more about this? Every muslimah in this world (inshaAllah) wanna be the best wife ever to their loved ones, not only to gain happiness in this world, but also in hereafter (akhiraah). But we can see changes in this last 2 decades. Women become busy in their job-life and begin neglecting their role as wife and mother (may Allah save us from this). I hope every sister, to make sure they dont forget to fulsill their responsible. I dont mean that every muslimah should be a housewife and spend 24hours in home, doing nothing. Me, myself inshaAllah will become a doctor soon. All i am saying is, make sure u dont forget the responsible. Its not a curse, in fact its a good reminder. One who married is different than who bachelor. A woman who has married, and have childrens (inshaAllah) gain more reward than one who haven’t. Why i said so? Woman who gave birth, who take care of her child, who serve her husband, who raise her child with good manner and knowledge is more better than who never had a chance to do all this. Yes, Allah knows better who is good and who is bad. And Allah see the intention of every deeds, but… one who get married, will also reward by many title as “mother”, “wife”, “mother-in-law”, “grandmother” and so so on. May Allah reward us with good life partner, ameen. This a very good post by you hope to come back more very soon. Thanks a lot. Yes, I’ve my mind to work on this blog again. You you could make changes to the webpage subject Marriage in Islam =) Saffaislam’s Blog to more catching for your content you create. I enjoyed the the writing still. SALAAM WALAIKUM! I AM NOT SURE WHEN WILL I GET MARRIED .WILL I OR I WONT….? ?BROKE OFF IN THE RELATIONSHIP MADE ME DOWN! Very nice article. I think marriage can be restrictive if you have the wrong mate. If you have the husband which shares your out-going nature then you will never miss the freedom you once had when you were single. I am a gay. I hate being a gay but I cant help it. I have no feeling for women at all. I want to have a normal life. I want to have kids. I want to have my own family. But how to marry a woman when I dont have feeling towards them? Why Allah must create gays? Why cant he just create normal people? Is it because He has created the Hell, so,if there’s no gays, His hell will be empty. To make sure His hell is full, He creates gays, lesbians, kafirun, etc. Is that true? Please clarify. Tired of praying for His answer already. If Allah created the world without tempations and if He created the world without good and bad then we would all be Angels – we’d all do good because we’d have no desire to do anything else. Being human is hard, because we have all these temptations, but the rewards for those who try their best (even if they never reach their end goal, but always try) for the sake of pleasing Allah, following the way of the Prophet (peace be upon him) and becoming a better person are massive. We all have troubles and struggles and we will do untill the day we die; It says in a Hadith that the world is like a prison for the believer and a paradise for the non believer. Remember though, Islam should be a balance between love for Allah, fear of Him and hope of His mercy, so nomatter how much you’ve think you’ve sinned or how bad you think you are, you should always hope and pray for Allah’s forgiveness, pray sincerly for what is best for you – not what you want. Sometimes these are two completely different things..
Anyways, insha’Allah you will read this and my ramblings make some sense. Salaam arz (May Peace, Mercy & Blessings of the lord be upon you). Why don’t you ask/clear your question and get it’s answer from the person who has a lot of knowledge and also wisdom because they’ll do it for you, I mean inshallah they’ll help you out. Actually you have a problem it seems and some questions/queries regarding the truth/good Religion i.e., Islam so i’d like to suggest you some sources for solving your problem. Visit this site, put your queries and try to contact them or follow them as you’re in need to be helped out. Ask/put your question/queries and your problem.